Everything is always easier the second time around, and building is no exception. Last year, we mulled over every step in our building project, and I made so many measuring mistakes that I begged my father not to point them out when he came to visit. Although we're still making the odd mistake here and there, our wood stove alcove project is flying along. Since we caught up on inside chores during a rainy Tuesday, we were able to spend all day building on Wednesday. We cut the piers to size, topped them with a couple of sill plates for bracket-less joist attachment, then a box of treated 2X6s with an extra one in the middle for an extraordinarily sturdy set of floor joists. Add a sheet of heavy plywood and we had the subfloor in place by lunchtime, despite having to tear off the trailer wall to get to it. Next came the alcove walls. After some head-scratching, we figured out that if we put three sides of the wall box together on the ground, we could top it off with the exterior plywood and square the wall in no time. 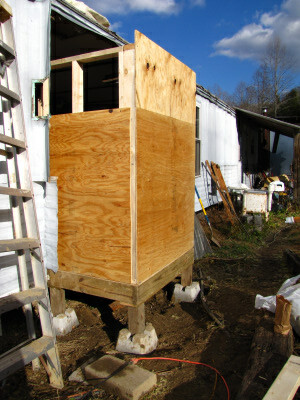 Then it was just a matter of adding on the top 2X4 and the ones in the middle and we had plumb walls. Let me tell you, nothing is plumb in the East Wing, so all of these ninety degree angles blew me away. We've worked all of the kinks out of our homemade chicken waterer so that you don't have to. Sawn edges of laminated materials need to be protected against moisture ingress. This goes for plywood as well as GFRP and CFRP! The water will cause delamination and with plywood this will lead to rot. So don't forget to really seal the edges of the plywood. Preferably with a two component epoxy or polyurethane. Or the plywood could rot away in as little as five years. A paint will not do the job. Even for plywood that won't come in direct contact with water? We were careful to get the exterior grade version this time around, and it'll be under the roof where it'll only get occasional splashes. Are you going to put siding over it? If not the plywood will come in contact with water when it rains. An exterior grade will resist better than an interior grade (a better glue is used). But a cut across the grain of wood will always expose the capillaries in the wood. The excellent "Handbook of Finnish plywood" states that "care must be taken to prevent the panel edges being subjected to rain, splashing or ground water". 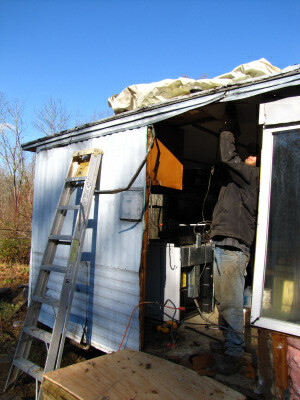 The plywood addition was T-1 11 siding with Coats of wood preservative. Thanks for weighing in, Daddy! I was wondering if you'd done anything to the addition to preserve it. I'm still thinking we can get away with paint on ours, though --- we've been keeping our eyes open for real paint when we hit the hardware store, but haven't found any mis-mixes lately. do you have a freecycle in your area? there might be people with partial cans of exterior paint that would be willing to give it away to you. then you could end up with a rainbow building. I've never had good luck with Freecyle around here. Even though it covers our area, you really have to go into the big city to pick most anything up, and it's not worth driving an hour each way usually. The old method of passing things along in rural areas is to lean good things beside the dumpsters rather than tossing them in. That way, people passing by can see them and snag anything they want. But when we were at the newly manned dump the other day, the overseer told me that he's not allowed to let anyone take anything away anymore, since the county is apparently making money off the scrap metal.